Sogn og Fjordane [ˈsɔŋn ɔ ˈfjuːɾɑnə] (English: Sogn and Fjordane) is a county in western Norway, bordering Møre og Romsdal, Oppland, Buskerud, and Hordaland. The county administration is in the village of Hermansverk in Leikanger municipality. The largest town in the county is Førde. Although Sogn og Fjordane has some industry, predominantly hydroelectricity and aluminium, it is predominantly an agricultural area. Sogn og Fjordane is also home to the Urnes Stave Church and the Nærøyfjord, which are both listed by UNESCO as world heritage sites. The Sogn og Fjordane University College has campuses in Sogndal, Sandane, and Førde. 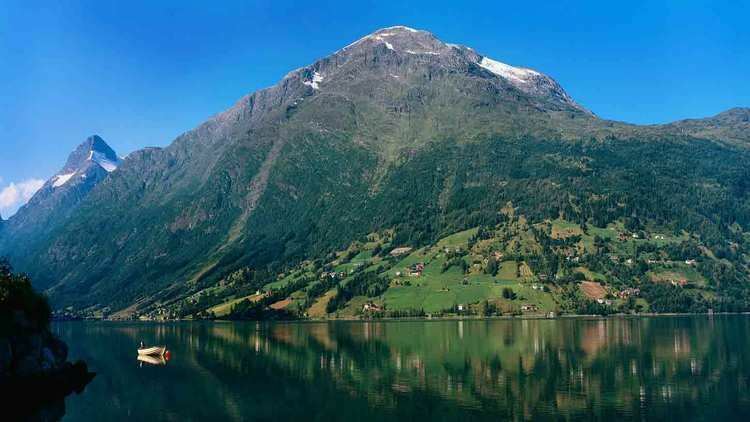 The name Sogn og Fjordane was created in 1919; a literal translation is: Sogn and the fjords. 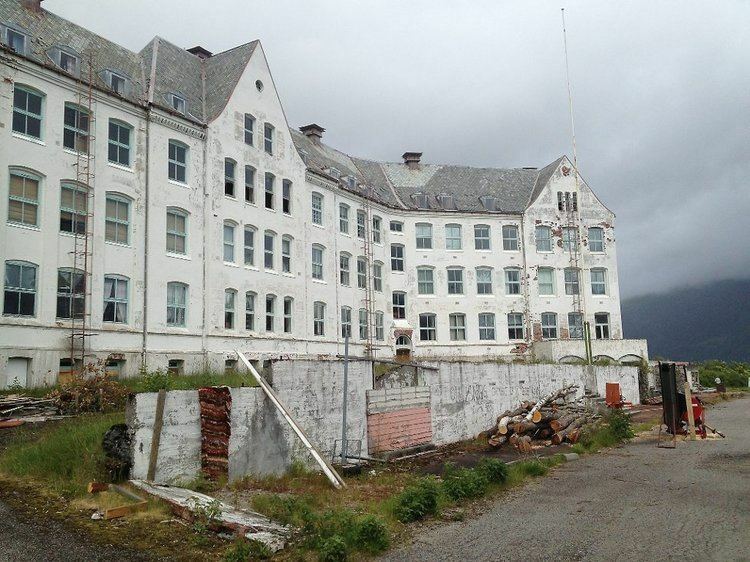 The first element is the name of the region of Sogn, located in the southern part of the county. 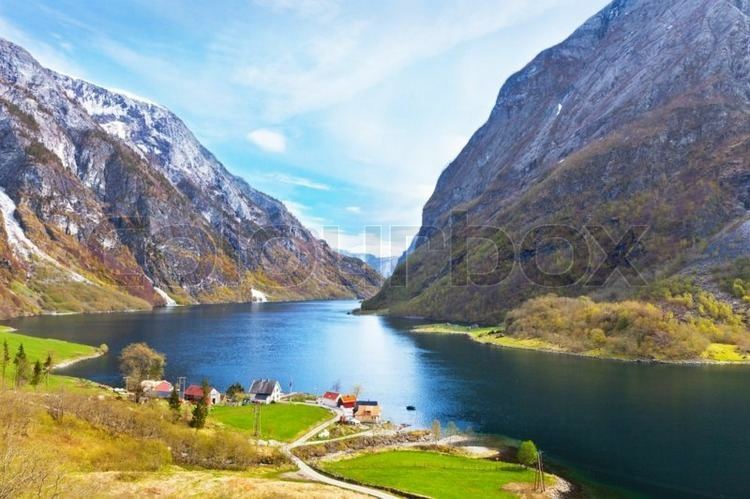 The last element is the plural definite form of fjord, which refers to the two regions in the county called Nordfjord and Sunnfjord in the northern and central parts of the county. The coat of arms of Sogn og Fjordane was granted on 23 September 1983. 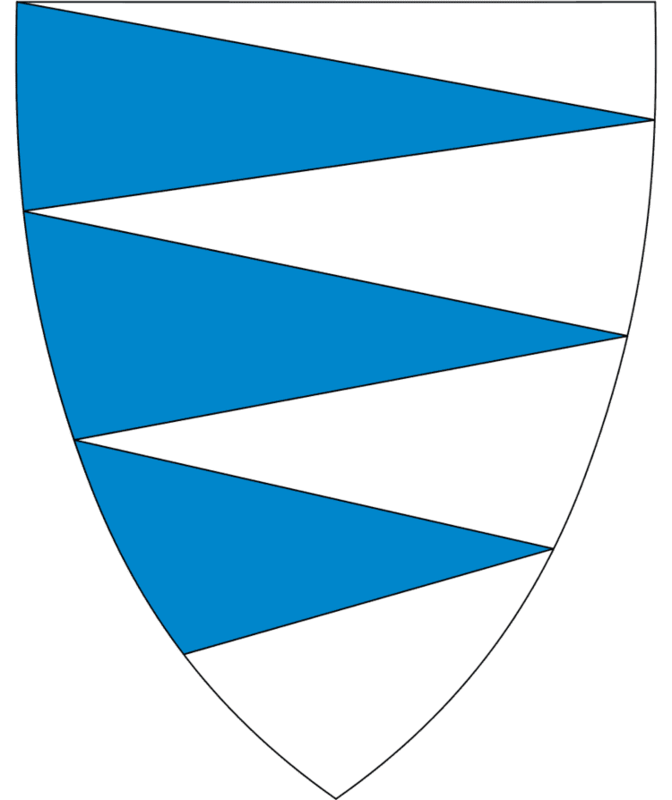 The arms show the geographical layout of the county: three large blue fjords protruding into the white colored land. The three fjords represent the three regions of the county: Nordfjord (surrounding Nordfjorden), Sunnfjord (with Førdefjorden), and Sogn (surrounding Sognefjorden). 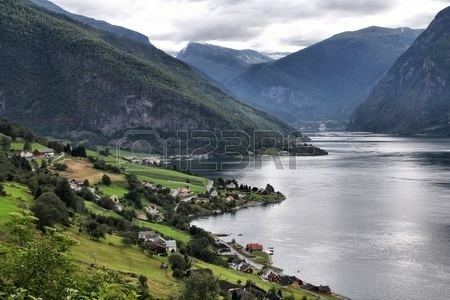 Nearly all villages and towns are situated along one of these fjords and the name of the county is based on the fjords. The county is conventionally divided into three traditional districts. These are Sogn (in the south), Sunnfjord (in the centre), and Nordfjord (in the north). Sogn surrounds Sognefjorden from Solund on the offshore island of Sula in the North Sea to the village of Skjolden in Luster along Lustrafjorden, a branch of the Sognefjord. The total length is 204 kilometres (127 mi). The middle district of Sunnfjord actually has two main fjords: Førdefjorden and Dalsfjorden. The northern district surrounds Nordfjorden. Sogn og Fjordane is the only county in Norway in which all municipalities have declared Nynorsk to be their official written form of the Norwegian language. The county currently consists of the two historic counties: Firdafylke (now the Fjordane region; Nordfjord-Sunnfjord) and Sygnafylke (now the Sogn region). These both were formed in the Middle Ages under the Gulating government. They were merged with Hordafylke (now Hordaland) and Sunnmørafylke (now Sunnmøre) to form the Bergenhus len in the late Middle Ages. The Bergenhus len was one of four len in Norway. It was administered from the Bergenhus Fortress in the city of Bergen. On 19 February 1662, a royal decree changed the name to Bergenhus amt. The Sunnmøre region was moved to Romsdalen amt in 1689. Later, in 1763, the amt was divided in half creating: Nordre Bergenhus and Søndre Bergenhus (Northern and Southern Bergenhus). Later, on 1 January 1919, Nordre Bergenhus amt was renamed Sogn og Fjordane fylke during a period of time when many location names in Norway were changed. A county (fylke) is the chief local administrative area in Norway. The country is divided into 19 counties. A county is also an election area, with popular votes taking place every 4 years. The Sogn og Fjordane County Municipality is the government that oversees the county. It is a group of 39 members who are elected to form a county council (Fylkesting). Heading the Fylkesting is the county mayor (fylkesordførar). Since 2011, the Sogn og Fjordane County Municipality has been led by Åshild Kjelsnes, the county mayor. She replaced Nils R. Sandal who was county mayor from 2003 until 2011. The county also has a County Governor (fylkesmann) who is the representative of the King and Government of Norway. Anne Karin Hamre has been the County Governor of Sogn og Fjordane since 2011. Oddvar Flæte was county governor from 1994 until 2011. The municipalities of Sogn og Fjordane are divided among three district courts (tingrett): Sogn, Fjordane, and Nordhordland. Sogn og Fjordane is also part of the Gulating Court of Appeal district based in Bergen. 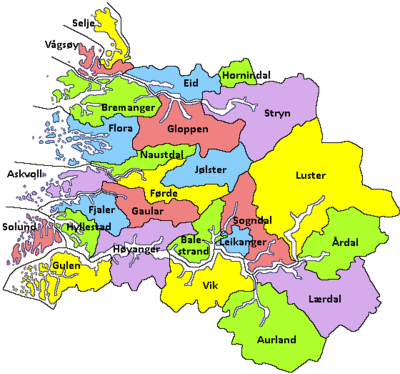 All of the municipalities of Sogn og Fjordane except Gulen and Solund are part of the Sogn og Fjordane police district. Gulen and Solund are part of the Hordaland police district. In 1837, the counties were divided into local administrative units, each with their own governments. The number and borders of these municipalities have changed over time, and at present there are 26 municipalities in Sogn og Fjordane. Originally the municipalities were the same as the old Church of Norway parishes. It is mainly a rural area with a scattered population. Sogn og Fjordane includes the largest glacier in mainland Norway, Jostedalsbreen, in the Breheimen mountain range, and the deepest lake, Hornindalsvatnet. There are also many famous waterfalls located in the area. Ramnefjellsfossen (previously called Utigardfossen) is the tallest in Norway and third tallest in the world and Vettisfossen is one of Norway's highest waterfalls with a vertical drop of 275 metres (902 ft). Both are located in the Jotunheim mountains. Cruise ships visit Sogn og Fjordane all summer because of the unique vistas of high mountains and deep blue fjords. The famous Nærøyfjord is located in the south of the county. This is a UNESCO listed fjord area. There are several archipelagos, including Bulandet, Bremangerlandet and islands around Florø. The westernmost point in Norway proper is Holmebåen in Solund municipality. The island of Unst, part of Shetland Islands is around 300 kilometres (190 mi) west of Holmebåen. The terrain changes quite rapidly with mostly smaller mountains on the coastline, gradually increasing to mountains reaching more than 2,000 metres (6,600 ft). Because of the steep rise in elevation and fjords cutting through the terrain, the amount of precipitation is very high. Low pressure systems come in from the west and meet the mountains (a phenomenon known as orographic lifting) and cause rain and snowfall. 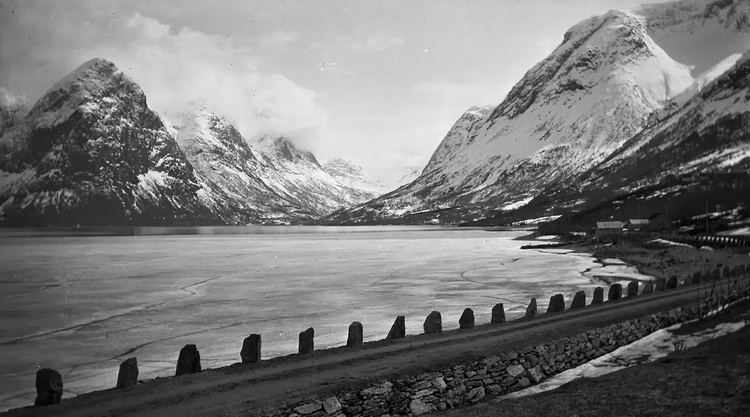 Transport is made more difficult because of the fjords and the mountains. The fjords have to be crossed by ferries or rounded, often a large detour. There are four airports in the county, at Florø, Førde, Sandane and Sogndal. There is only one railway station, Flåm. The county contracts bus and boat companies for bus and boat routes in the county, under the new (2015) brand name Kringom.